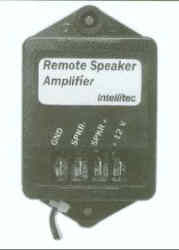 Intellitec's Remote Speaker Amplifier overcomes the problem of insufficient sound coming from televisions used in the noisy environment of RV's and Van Conversions. It boosts the sound of television and drives a speaker mounted where everyone can enjoy it. The unit mounts near the television set and plugs into the external speaker or earphone jack on the TV. Connections to an ignition switched +12 Volt supply, ground and two speaker wires are all it takes to install it. An 8 ohm speaker can be located in the vehicle where it will best distribute the sound. The volume control on the television still controls the sound level but the output is amplified up to 2.5 Watts. of the TV unlike certain other types of amplifiers.